. First up for today, it’s some solar charms for Exalted – in this case, a batch more-or-less designed to make the combat system a little more interesting by increasing the number of factors involved. Cost: 5M, 1W; Mins: Occult 3, Ess 2, Type: Simple.
. The occultist draws forth a myriad fragments of possibility from the chaos underlying the cosmos and blurs the boundaries between himself and elsewhere. Finding him within the shattered mirror of reality becomes nigh-impossible. For the duration of the scene, the user may add his or her net Occult skill dice to his or her Dodge skill dice when calculating his or her DV. Cost: 4M; Mins: Occult 4, Ess 3, Type: Reflexive.
. Once Ghosting Technique is in effect, a true adept may choose which possibility of existence to make real at any given moment. The user may, at any point during an attack sequence – including after the result is determined – decide that an attack or flurry was actually made against one of his or her quasi-real images, and thus perfectly negate it. This will not, however, work against effects which target areas greater than (user’s Essence x 5) feet in radius – a unique flaw of invulnerability. It will work against individually-targeted non-attack effects as well, although using it in social combat is simply a fancy method of running away.
. Yes, this is intentionally priced so that the user may occasionally opt to take a not-too-serious hit in preference to spending motes. Prerequisite Charms: Child of Phantoms.
. This effect permanently enhances Child of Phantasms; when the user activates that charm, he or she may spend an additional two motes to “have been at any location within (Essence x 5) feet all along”.
. All things are made up of essence, patterns overlaid upon underlying chaos. 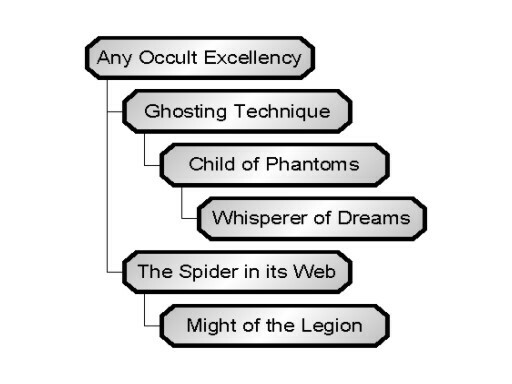 A wise occultist can soon become aware of the patterns in that web – and of disturbances thereof. The user may invoke this charm in response to an unexpected attack to render it no longer unexpected, turning it into a normal attack of whatever type. The charm may also be evoked to locate all opponents and major landscape features within (Essence x 10) feet.
. Might of the Legion allows the user to use the Occult skill to open mystical links with his or her magical allies. The user may, as an innate power, expend 6M and roll (Int + Occ) to exchange thoughts and sensory impressions with up to (Successes) other characters with essence pools who have participated in a bonding ritual with him or her (Ritual of Bonding, Degree 0, Int + Occ, D2, no resource requirements, ten minutes). Such links will remain active for the remainder of the scene. Once such links exist, the user may spend a point of temporary willpower to allow up to (Int/2) contacted allies to channel essence-based powers through them, and through him or her – taking effect as if the user was present beside the character using this ability.